In its Missouri Valley Conference season opener last weekend, the Bradley baseball team was swept by the Evansville Purple Aces in a three game series. On Tuesday and Wednesday, the Braves beat nonconference Western Illinois and SIU-Edwardsville in two midweek games. Bradley (12-10, 0-3 in the MVC) outhit or had the same number of hits as the Aces in each of the three games. This season, Bradley has not been able to take advantage of opportunities while at the plate. The Braves went 2-for-17 over the weekend with runners in scoring position. Head coach Elvis Dominguez summed up the series quickly. He highlighted the disappointing performance offensively, despite Bradley pitchers boasting a collective 2.39 earned run average. The first game, an 11 a.m. Friday contest, was a pitching duel. Evansville’s Adam Lukas threw six scoreless innings, striking out nine to earn the win, 1-0. Bradley seniors Mitch Janssen and Cole Cook combined to limit the Aces to three hits. Bradley nearly struck first in the third inning when freshman first baseman Connor O’Brien knocked a single to right field following back-to-back walks. Designated hitter Eli Rawlinson, however, was thrown out at the plate trying to score from second base. That same right fielder, the Aces’ Troy Beilsmith, scored the lone run on a single to right field in the sixth inning. The next afternoon was a bit more exciting for fans of Bradley’s senior right fielder Jean-Francois Garon. He went 4-5 at the dish. Although his performance was noteworthy, none of his hits came at key points of the game. An eighth inning Bradley rally brought the score within one, 3-2, thanks to junior Dan Bolt’s laser shot over the right field wall. Unfortunately for the Braves, Garon was picked off at first base a few pitches before. Evansville pushed another run across in the ninth to win 4-2. 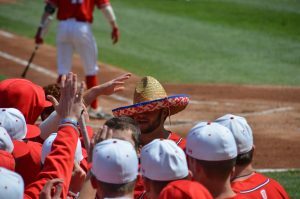 On Sunday, Bradley again failed to capture its first MVC win after senior Allan Beer suffered his first blown save of the season. The Purple Aces scored four runs in the top of the ninth to complete the sweep, 6-4. Garon was the bright spot again for Bradley Sunday. He hit his first home run of the season over the left field fence to knot the contest at two in the third inning. In the eighth inning with runners on first and second, senior pinch hitter Nick McMurray pulled a single into right field, scoring one. Bradley led 4-2 until the ninth. Evansville scored four runs on four hits, a walk, fielder’s choice and an error in the top of the eventful ninth. Garon thought he played patient and got the right pitches to hit over the weekend. “I think the approach is just be on time with the fastball. I was just fortunate to get a good pitch to hit with two strikes,” Garon said. Garon said he’s confident that his teammates will come up clutch soon. In the meantime, he will continue to trust the pitchers. 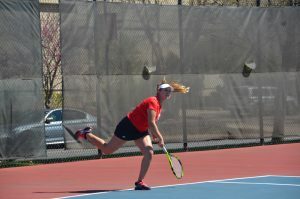 In the nonconference contests, Bradley’s offense broke out and mercy ruled Western Illinois, winning 10-0 on Tuesday. In the sixth inning, Bradley pushed across four runs thanks to back-to-back doubles. They were able to expand the lead to 10 and claimed the victory in the eighth inning. Bradley’s senior pitchers Cook, Janssen and Ben Cilano limited Western Illinois to two hits. On Wednesday night, SIUe scored first but only one of its six runs were earned. The Cougars scored five runs in the fourth inning after junior Luke Shadid’s error at shortstop to start the inning. Bradley responded by scoring at least one run each inning from the fourth on, winning 9-6. Cook said that he is proud of the way he and the pitching staff have limited scoring and saw offensive improvements in the midweek contests. Bradley will play Eureka at 6 p.m. tonight and Robert Morris-Springfield for 12 p.m. matinees Saturday and Sunday.